A stunning series with so much detail! Everything you would expect to find on a sunny day combing the beach.....starfish, coral, shells and smooth pebble like quartz beads, mixed with natural textures such as twine and wood in gorgeous colour palettes. Available in satin silver plate with marine blues and greens OR satin gold with tropical greens, sandy shades, blues and corals. Beach comber stretch style charm bracelet from 'The Bohm'. Lots of beautiful details. Various beads and motifs measure 8mm up to 2.5cm/25mm. Length od chain cascade 6.5cm/65mm. Inner circumference un-stretched 6.5 inches/17cm. Beach comber necklace from 'The Bohm'. Lots of beautiful details. Various beads and motifs measure 8mm up to 3cm/30mm. Pretty 4mm rope style chain. Length 17 inches/44cm to an adjustable 20 inches/52 cm. Beach comber ankle chain from 'The Bohm'. Lots of beautiful details. Various beads and motifs measure 4mm up to 2.5cm/25mm. Length of chain cascade 5cm/50mm. Adjustable length 9 inches/23cm to 10.5 inches/27cm. Beach comber carved flower earrings from 'The Bohm'. Flowers measure 2.5cm/25mm set into a claw back. Total length 4.5cm/45mm. French clip fastener for pierced ears. 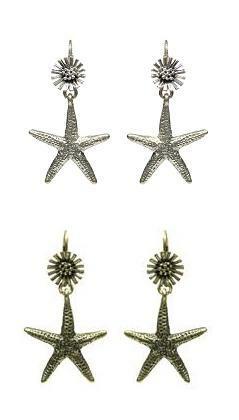 Beach comber starfish earrings from 'The Bohm'. Starfish measure 2.5cm/25mm and they dangle from a small flower. Total length 5cm/50mm. French clip fastener for pierced ears. Beach comber sea shell earrings from 'The Bohm'. Finely detailed. Shells measure approx. 2cm/20mm. Total length 3cm/30mm. French clip fastener for pierced ears.